Though much maligned for its invasion into the air Utahns breathe, carbon is an element that is everywhere, throughout the earth and in all living creatures. In the human body, it’s the second most abundant element, right after oxygen. 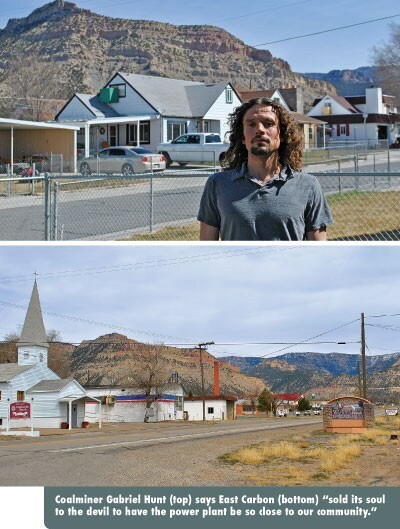 And in the heart of Utah’s Carbon County, carbon—the primary stuff of coal—is the lifeblood of the residents and the hardscrabble communities formed to mine the black gold that has powered the world for generations. Utahns en route to Moab from the north for some fun in the sun can’t miss the telltale signs of coal country: the coal-filled train cars snaking up Price Canyon; the billboard outside Helper advertising the “World’s Tallest Coal Miner” statue; and the billboard outside Price with a picture of a stoic, soot-stained miner holding a chunk of the black stuff under the declaration COAL=JOBS. Most passersby won’t get much of a glimpse of the frontline of these mining communities as they continue on Highway 6. But if you take a detour 20 miles east of Price, you’ll find the side-by-side communities of East Carbon and Sunnyside. Like everywhere else in the county, coal is king in these two towns. But for some, it comes at too high a cost. East Carbon has supported itself on several adjacent mines as well as the coal-fired power plant in Sunnyside, roughly a mile east of town. It’s a small and hardy community born of the coalmining boom, and it’s always prospered on coal, while other enterprises struggled to take hold. A drive into town reveals a vacant drive-in cafe and the New Yorker Grill, which optimistically has “Open” painted on the window despite being empty inside except for stacks of dusty chairs and tables. A simple gas station in the center of town is one of the few businesses that’s alive and well. More than 1,000 residents live here, in neighborhoods lined with homes that vary from rundown sheet-metal shacks to well-groomed pre-fabricated dwellings. Bleached bones and elk antlers decorate homes, and the brown dirt and yellow grass of vacant lots is punctuated by lavender patches of ironweed. Overall, it’s an attractive town, except when it’s covered in a fine film of dust blown off the nearby coal-ash landfill. Sunnyside is home to a coal-fired power plant that burns the refuse from two abandoned coalmines that operated in the area for more than a century into what’s known as coal ash, a gritty gray substance. Coal ash is a byproduct of the fossil-fuel industry that’s less visible to the general public, which has long been focused on the hazards of carbon emissions in the air. But it’s lately drawn scrutiny from environmental scientists, who say the heavy metals in coal ash—such as arsenic, lead and selenium—can contribute to cancer and developmental and neurological disabilities in humans. And every day in Sunnyside, 18-wheeler trucks haul up to 1,000 tons of coal ash into the 75-acre landfill, building a giant ziggurat-shaped pile of ash inch by inch, day by day. It’s possible to drive down State Road 123, which leads into town, and miss the Sunnyside Cogeneration Association landfill, built in 1992, entirely. Still, residents say, they see all they need to of the dust—and breathe it, too—when the wind picks up and blows ash off the pile and into town. “I think our town sold its soul to the devil to have the power plant be so close to our community,” says Gabriel Hunt, a 33-year-old East Carbon resident. Hunt isn’t your conventional activist rallying against big polluters. He took time to speak to a City Weekly reporter after finishing an all-night shift at a coalmine more than an hour north of East Carbon. He’s not against coal, but he is against the company’s decision to burn it, pile it and let it potentially contaminate the groundwater where his two children live and play. While Utahns in Salt Lake County curse the carbon emissions hanging in the winter air like clouds of gravy, in places like East Carbon and Sunnyside, the concern is more about the gunk on the ground. And as the public places more pressure on the fossil-fuel industry to clean up the emissions in the air, more risk could be absorbed by communities like East Carbon and Sunnyside. The most hazardous parts of carbon emissions can’t be eliminated entirely, so “cleaning up” dirty carbon emissions means that they’re simply displaced—instead of going into the air, the emissions are filtered and transferred to the coal ash, which ends up in landfills like the one in East Carbon. In January, on behalf of town residents like Hunt, HEAL Utah helped file an administrative complaint against the Utah Department of Water Quality for approving a 34-acre expansion of the Sunnyside Cogeneration Associates landfill. HEAL Utah is not only concerned about the health effects of the landfill but also questions why state regulators would approve the groundwater permit even though the legally required public-comment period didn’t include relevant information about the hazards of the existing landfills. It wasn’t until December 2013, four months after the public-comment period on the groundwater permit ended, that HEAL Utah received documents through a public-records request that they say show the existing landfill is contaminating the groundwater. Now, HEAL is asking not only that the groundwater permit for the expansion be invalidated, but also that the existing coal-ash pile be relocated because of its contamination of local aquifers. When it comes to the expansion, HEAL says, the state should at least follow statutory requirements to use “the best technology available to minimize the discharge of any pollutant.” Scientists who have studied coal-ash landfills have found that simple liners can dramatically protect the groundwater beneath the waste piles, yet the state approved the expansion to be unlined, like the existing landfill. If coal power is the dirty and addictive energy source to the economy—the way a cigarette is to a smoker—a liner on an ash landfill is at least an ashtray. Critics say not requiring a liner is like letting a smoker drop ash in your glass of water. It usually takes a catastrophe for policymakers to snap into action. With coal ash, it took a dam bursting in Tennessee in 2008 that flooded a river valley with 1 billion gallons of toxic slime for policymakers to ... almost do something. The dam break unleashed its own flood of outrage about the unregulated landfills, which are as widespread as coal-power plants across the country but aren’t federally regulated by the Environmental Protection Agency. In 2010, in the wake of the 2008 coal-ash calamity in Tennessee, the EPA proposed new regulations that faced heavy resistance from the coal lobby and politicians like West Virginia Republican Rep. David McKinley, who passed legislation in 2013 to block the EPA from regulating coal ash, arguing that recycled coal ash is a valuable recycled product and that regulating it would kill hundreds of thousands of jobs. Hundreds of other coal-ash spills have been reported since 2008, from small and troubling to large and ecologically devastating, such as when a pipe burst at a wet coal-ash landfill in North Carolina and pumped 82,000 gallons of coal ash into a river used as a source of drinking water for the residents of Danville, Va., 20 miles upstream. In 2012, the Sierra Club and a coalition of other groups sued the EPA for violating its own statutes by not offering guidelines on coal ash, prompting the agency to announce that new rules and regulations will be issued by the end of 2014. Coal ash, which is often comprised of toxic heavy metals such as arsenic, lead, mercury and selenium, has long been known to cause deformations in wildlife and cancer and neurological damage in humans. Lead poisoning, for example, can cause developmental delays, impaired hearing and male reproductive impairment. The nonprofit Physicians for Social Responsibility issued a report in conjunction with advocates of EarthFirst—one of a group of plaintiffs that sued the EPA in 2012—highlighting some of the horror stories of people who had come too close to coal ash. HEAL Utah’s complaint against the Utah Division of Water Quality for its approval of the expansion of the Sunnyside landfill includes residents’ descriptions of the ash blowing into town and covering cars, lawns and homes in a film of sooty dust. One resident mentioned seeing dead animals floating in ponds near the plant and questioned the safety of another ash landfill so close to town. Four East Carbon and Sunnyside residents added their names to HEAL Utah’s official complaint, filed Jan. 6, 2014, but declined to comment on the advice of their attorneys, who felt comments to the media would jeopardize their action against the state. Hunt, who is not an official declarant on HEAL’s petition, says the trucks carrying the ash are another problem. “You get behind one of those semis on the highway, and more often than not, you can see the ash and the emissions coming out of the back of their trucks,” Hunt says. Because the ash is super hot when hauled, it has to be mixed with a water slurry for transportation, and that can blow out the back of the trucks as they drive through town and down the hill to the entrance of the landfill. Those who’ve spoken out against the landfill cite fear of a public health hazard; no one who has talked with HEAL cited specific illnesses. But HEAL doesn’t want to wait for a health catastrophe, especially after it enlisted the help of a Brigham Young University geology professor who says that the landfill is contaminating the groundwater with dangerous—and illegal—levels of toxic pollutants.